All Iron Rooster locations will sell the Starfish "Roostart" in April to benefit the Believe in Tomorrow Children's Foundation. BALTIMORE, Md. — A new pop tart, or "Roostart", will be gracing the menu at all Iron Rooster locations in April. 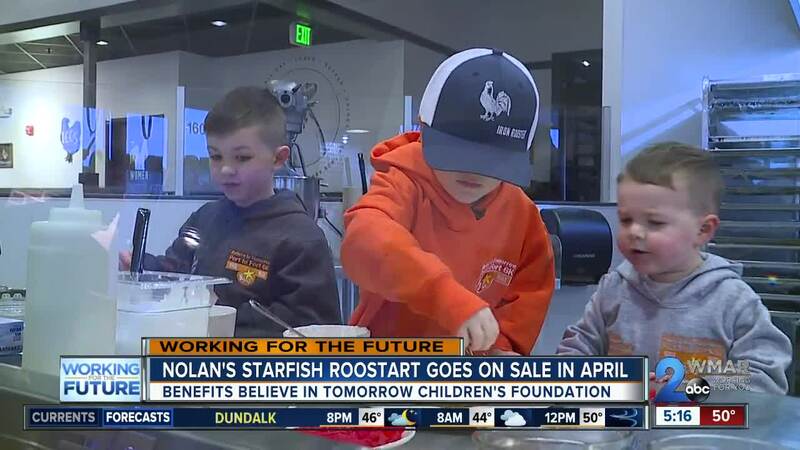 The special Roostart called the Starfish was created by 5-year-old Nolan Brewer, who is currently being treated for a cancer called neuroblastoma. He had the opportunity to go make his creation at the Iron Rooster at McHenry Row in Locust Point. Kyle Algaze, the owner of Iron Rooster, was eager to see how Brewer would do behind the Roostart-making bar. "This will be our first take over with a 5-year-old, but I think it will be exciting. I think we're going to be in for some fun," he said. The Starfish Roostart is filled with mixed berries and topped with vanilla icing, along with two of Brewer's favorite treats, Swedish Fish and Starburst candies. A portion of the proceeds from Brewer's Roostart will go to the Believe in Tomorrow Children's Foundation based in Baltimore. The non-profit works with critically ill children and their families. The starfish also happens to be the logo of the non-profit. They provide housing to families who have children being treated at Johns Hopkins Children's Center. They also provide respite housing for any family across the country who has a sick child. Believe in Tomorrow has several respite locations, including ones in Deep Creek and Ocean City. "Families throughout the country that are going through active treatment can get away from the hospital and just the crazy life that happens," said James Poisal, the director of development at Believe in Tomorrow. "Your life changes when you're going through treatment for a child's illness." Brewer and his family will be using one of the respite sites for a week to take a break from his treatment for the neuroblastoma. Brewer is also the "Face for the Race" for the upcoming Port to Fort 6K event which also benefits Believe in Tomorrow. Port to Fort is being held on Sunday May 5. It is a family-friendly event that includes a race around Fort McHenry and a post-race lunch provided by the Iron Rooster. For event details and how to register, click here.